If you live in a council property, rent privately or rent from a housing association you will not be able to benefit from the free solar panels being offered by private companies directly. The reason for this is that companies will only deal directly with the owner of the property and not the tenant. The offers being made to install solar panels for free are not being made by the government but by privately run companies. The deal is that they will install and maintain the panels and claim the governments feed in tariff and you get to use any electricity the panels generate over their lifetime. What If I Am On Benefits, Can I Get Panels Installed For Free? As I said, this is not a government run scheme but a privately funded scheme open to property owners. You have to own your property to qualify for this offer. This is not like many of the government run schemes where retired, low income or people on certain types of benefits can qualify. Will I Ever Be Able To Benefit From Free Electricity If I Don't Own My Own Home? There are many councils and housing associations that are currently or are planning on installing solar panels on their properties. This is being done on a council by council basis. There is no specific funding from central government to do this. You should contact your local council housing office or housing association and ask them if they plan on installing panels to provide free electricity to their residents. If you are privately renting you could contact your landlord and explain the benefits of getting solar photovoltaic panels installed. If your landlord approached on of the free solar panel installers they would benefit from their tenants getting free electricity. This would make their property more attractive to potential renters as tenants would benefit from free electricity for at least 25 years. Alternatively your landlord may consider funding their own solar panel installation in which case they would benefit from the government feed in tariff payments that are guaranteed for 25 years. As a rule of thumb if they paid out £10,000 to get the panels installed over a 25 year period they would get paid £25,000 back from the government. In addition whoever lives in their property would benefit from free electricity for as long as 40 years, depending on how long the panels continued to work for this could be longer. No matter who your landlord is they could benefit from the same FIT payments and their tenants would benefit from the electricity that the panels produced. 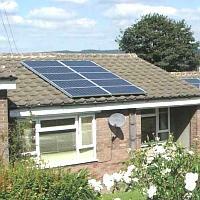 You can contact your landlord directly and ask them if they plan on installing solar PV panels on their properties. They may not have heard of solar panels or the generous feed in tariff payments they can benefit from. It would be in your interest to make them aware of the companies that are currently offering to install these panels for free. A lot of people have assumed that the free solar panel offers are a government run scheme and therefore people on benefits or a low income will qualify. Unfortunately this is not the case and you have on the whole be a homeowner to qualify for these offers. Ironically it is the people who spend more time at home who will benefit from solar the most as they will be at home to use the free electricity that the panels generate. Recently I have seen more investors and solar companies moving towards getting free solar installed on council and social housing homes. It looks like Solar Europa has plans to install solar on some 200,000 UK properties over the next 4 years. They are in discussions with councils and social housing landlords at the moment but with such a large number of installations promised it means a significant number of people are going to benefit from this. If you are a council or social housing tenant then it looks like it's just a waiting game to see if your landlord makes a deal with Solar Europa. You can however contact your landlord and let them know about this scheme and you may end up benefiting sooner rather than later. This is going to be a great benefit to thousands of households and generate thousands of jobs, this is exactly the sort of scheme the governments feed-in tariffs should be encouraging.